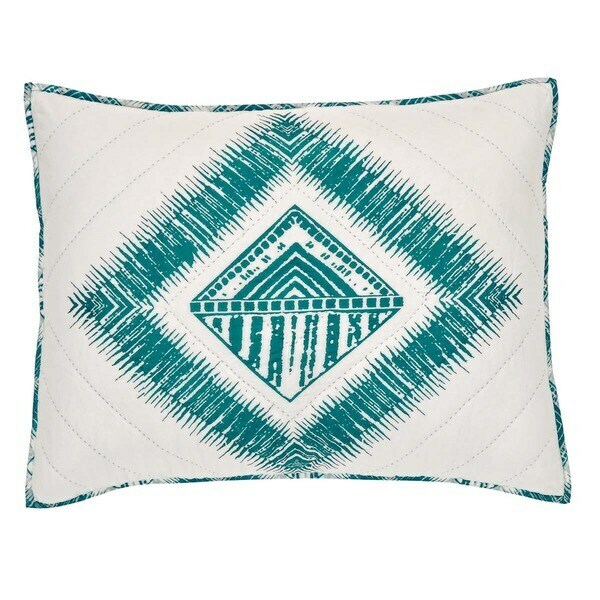 The Karina Standard Sham features one large teal diamond motif in the center on marshmallow creme base accented with striking echo hand quilting. Soft, 100-percent cotton grows softer with every use. Three tie-closures on reverse. These were an additional purchase to match bedspread and king size shams. I wanted some extra pillow shams for my standard size pillows and these work nicely with the matching bedspread. What I really like about these shams is that they are soft enough to sleep on. I have washed the others shams and bedspread several times and I can see no difference in the color. The color is really colorfast and old shams are not faded at all compared to the new shams! This sham is cute and coordinates perfectly with the Karina quilt. Needed these to go with another comforter in same color scheme. Love this entire bedding ensemble! I love this whole related group of bedding items (Karina). The blue is aqua bright and brings my bedroom to life and is calming like the sea. Love it!